The above image is a composite of 4 full resolution Canon 7D Raw files and is over 110megs. This composite was created in a few minutes using Photoshop CS5’s PhotoMerge. 1. Select the files to be combined. PhotoMerge is buried under File > Automate > PhotoMerge. In the above pop-up dialog box, simply click the Browse and add the photos to be merged. It is helpful to have Vignette Removal and Geometric Distortion Correction checked. 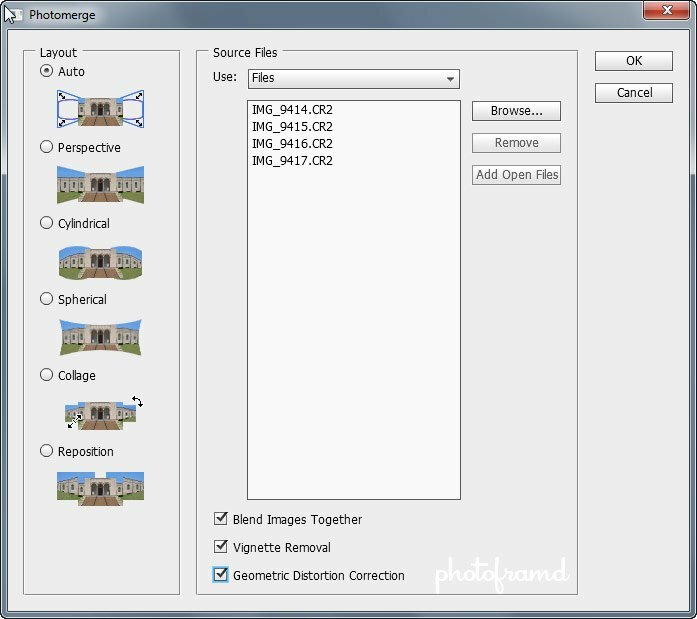 Blend Images Together will create smooth blends between the layers with masks. 2. The merged photo may need some work. The above image looks a little drunk … a result of taking the photos taken hand-held without a tripod. Why should I make it easy 😉 You will notice that each photo is on its own layer with a mask. Perfect for fine-tuning, if needed. 3. Use Puppet Warp to straighten the image. You could try using the Warp to straighten the image, but Puppet Warp is sooooo much easier! Select all of the layers and convert to a Smart Object. Got to Edit > Puppet Warp to begin. Start at one end of the photo on the horizon and add a pin. Add additional pins along the horizon where the image needs straightening. Be sure to add on final pin at the end of the image to anchor it. With the pins in place, just click on a pin and pull to straighten the image. Simple! (If you would like additional info on Puppet Warp, take a look at my tutorial Puppet Warp turns a Frown into a Smile. 4. Fill blank areas with Content Aware. Start by Control/Command clicking on the Smart Object layer. Then, Control/Command + I to select the blank areas. Go to Edit > Fill to trigger the Fill pop-up box. Be sure to change the drop-down to Content-Aware and click OK. Depending on the size of the image, you may see an error that you do not have enough memory to complete the task. If so, just reduce the selection to smaller portions and apply the Fill. Any problem areas can be touched-up with the Healing Brush using Content-Aware. 5. The final photo is HUGE! The final composite photo is over 110megs with a resolution of 240 DPI enough to make a Photo Editor giddy with excitement! I never get these results from my Nikon D300s! I have been trying to build some large images, but I am really getting annoyed at the resolution. Why doesn’t Nikon increase the resolution on its camera! What good is 12meg images?? That’s a very good question! The Canon 7D’s sensor yields over 18 megapixels while most of the Nikons tap out at 12 megapixels. That’s a 2/3’s difference in pixels. And, when you are trying to composite a large image file, the difference is even more significant. When I was using my Canon 20D to take photos I did a lot of panorama photography. I had 2 reasons to do panos so often. One was that I didn’t have a wide angle lens – the 1.6 crop factor made this even more of an issue. The second reason was that the 20D only had an 8 megapixel resolution and I liked printing big. I found that panoramas solved both of these problems. In fact, I find that I have to be careful with the 7D that I now have because if I still use my old 50mm lens to take a pano I end up with a bajillion megapixel image because I have to take so many pics to compensate for the 50mm lens and the 1.6 crop factor. Even just a half-dozen images stitched make a HUGE freaking file. Anyway, my point is that you can easily make an image that will print out to any size and with good resolution using a 12 megapixel camera. Just be sure to take enough images to make up the pano. You will need a bigger zoom (mm size) to create a pano of more images and a lesser zoom for a pano of less images, so go with a higher mm size lens. Also be sure to use a lens that is sharp enough. My old 18-50mm kit lens had to be pitched and replaced with a Tamron 17-50mm to get images that were sharp enough and without a ton of chromatic distortion. Good luck and check out http://www.tawbaware.com/maxlyons/ , he has gone to using just a Canon G9 and he gets nice, detailed and huge panos. So how’s the 64-bit machine working for you? I have been getting tired of constantly waiting for my photo processing for panos, Topaz plug-ins and Photomatix. I think it is because I only have a 32-bit 2GB machine. Because of that I think my harddrive is constantly spinning to make up for the huge memory requirements of this type of processing. I also think that the 7D has made it worse being 18 megapixels. Is the 64 bit thing working out for you? I’m thinking about going 64-bit and getting a ton of RAM to try to avoid all of this waiting. Any thoughts? Huge improvement over XP64! After installing Windows 7 64-bit Professional, I upgraded the Ram to 10GB and the graphics card to Nvidia Quadro 3800. The workstation flies! No problems handling large files. Some of the panoramas are over 250MB. It also allows me to edit video in real time with Premiere CS5. Definitely worthwhile. Oh man, now you’re going to talk me into dropping some cash…. Hello! Thanks for this tutorial. I’m writing just because I don’t know how to fill blank area with Content Aware. I’m using Mac so some command are different. Could you help me? I have several tutorials on Content Aware Fill. Start here. Ok, I checked and I found where I missed! Thank you! 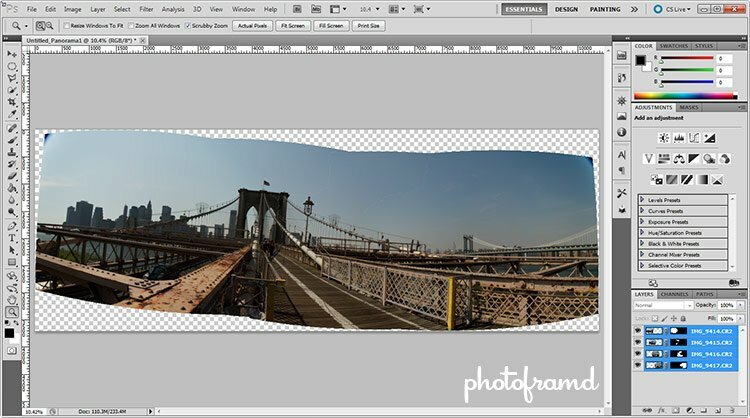 Thnx for this tutorial…im creating a pano..however i cannot go beyond step 3…i used puppet warp. then convert it to smart object..after that i selected smart object layer..and pressed Ctrl+I..nothing happens…and Fill option remains invisible…What shud i do? When you Control-click on the Smart Object, do you see its selection? If so, then inverting the selection through Control-I will work to select the blank areas. From there, it’s just a matter of filling the selection using Content-Aware. Thanks for the tutorial, had a lot of success, and Puppet Warp was fun! I also had trouble with the content aware fill – was able to select the layer and the blank areas, but fill was grayed-out. Many thanks for very fruitful information about photomerge. I am teaching digital photography. Recently I have faced problems with canon digital cameras of my students. Three have canon 600D and 60D with 18 – 135 zoom lens. When taking cameras downward and try to focus the lens zoom part fells down and does not permit them to focus. Not in either auto or manual focus function. They all brand new. the two others are canon G10 and G12. focus quality is not sharp as in compare to nikon or even canon ixus 130 or lumix FZ150. Could you kindly let me know why this problems exists and how to solve them. Did your student drop the lens? If so, there could be internal damage which is preventing it from focusing. Otherwise, every lens has a minimum distance which is necessary to achieve a focus lock. This would apply even if you tried to focus manually. (It would never be sharp.) Try moving further away and zooming in. You could also try an Extension Tube which will allow you to focus closer than normal with the lens.